Beeswax Lip Balm Tube - Get naturally soft, healthy-looking lips. Give your lips the soothing feeling they deserve. This natural lip balm is loaded with coconut and sunflower oils, rich in vitamins and essential fatty acids, to nourish, condition and soften lips. Beeswax seals in hydration. We've even added peppermint oil for a refreshing tingle. No wonder it is our most popular product. How to Use: Apply balm liberally to your lips as often as needed, particularly in dry, cold or windy conditions. Ingredients: Cera alba (beeswax, cire d'abeille), cocos nucifera (coconut) oil, helianthus annuus (sunflower) seed oil, mentha piperita (peppermint) oil, lanolin, tocopherol, rosmarinus officinalis (rosemary) leaf extract, glycine soja (soybean) oil, canola oil (huile de colza), limonene. I wouldn't go back to any other options. This is the most protection you'll ever get if you have sensitive of dry lips. This is my companion all year long, not just during the cold season. I also find it to be the best preparation before I apply a long-lasting, heavy duty lipstick that is likely to make my lips dry. I have used many different lip balms and was looking for something natural. I had chapped lips this winter and after using this product for a week they are nice and smooth. I use this everyday and my lips look great. Love this lip balm! I use a lot of it during the winter months, especially, so it's nice to know I'm not sucking up a bunch of chemicals. Best lip balm on the market!!! So happy to find a lip balm that wasn't 'perfumy' and Burt's Bees hasn't disappointed. This one has a mint flavour but it's not too strong and very refreshing. It works well. Most hydrating lip balm. The only one I use when my lips are very chapped in the winter or I have a cold because it's so soothing and hydrating, others I have to constantly reapply but not this one! Awesome lipbalm! Very nourishing and moisturizing, especially for dry lips. The mint scent is also refreshing. Would highly recommend. Wonderful to find a lip balm with a hint of mint and no perfumey-ness. Really does a good job. I've looked for it locally and couldn't find it so I was very happy to find it here at well.ca! Love this lip balm. Not fancy or colourful, but excellent and works better than anything I've tried. LOVE this Burts Bees Original lip chap. It's the only one I will buy and I use it religiously. Have them at my bedside, in my car, purse, and coat. Love the natural feeling and taste and it works so well. Love this product! I keep buying it because it moisturizers my lips perfectly! I use this product all the time, don't leave home without it. Love it, it's an essential in my make up bag! I have used many different brands of lip balm but in this product I've found my favourite and will not be experimenting again. This lip balm goes on smoothly and lasts all night! I reapply about 3-4 times per day but that seems more than reasonable to me. I always have one of these little tubes with me. One of the worst lip balms I have ever used. The texture is too thick. The longer it stays on the lips, the stickier it becomes. Best lip balm I have ever used! I never go anywhere without having one of these in my purse. I have been a fan of this product for over 5 years, and still love it! Love this lip balm - I buy it anytime I see it on sale. I love the tingly peppermint on my lips. Love this natural lip balm! Lasts longer than other brands. What a fantastic lip balm, doesn't dry your lips and moisturizes and softens. Just use once or twice and your lips are back to normal! I tried every lip balm on the planet until I found this one. It's the only one I buy now. It's the best! Soothing, protective, awesome. Burt's lip balm is a small miracle. Works like magic. Thank you. I wish I could give this ten stars. I've tried dozens of chapstick over the years. This stuff takes the cake. Love this stuff! It works wonders on dry, chapped lips! Works wonders on severely dried, chapped lips with regular use. Have been using this product for years. My last order seemed to have a different texture...harder somehow and does not go on as easily. Still has a nice tingle though so I will stick with it. Wait for it to go on sale for sure as regular price is a bit high in my opinion. I actually prefer this to the ones that glide on more easily. It lasts much longer. This product also has a nice, pleasant taste that is not overpowering. Used to be my favorite, the last couple have been waxy. The other flavours glide more smoothly. Great product. Sticks to the lips and lasts a long time. Love the natural ingredients. My favourite lip balm. Leaves my lips with a slight tingling feeling. Light and pleasant smell. While the menthol can be really strong in this lip balm, it's the only thing that stops my lips from splitting open when they get really dry and it is ideal for preventing those raised flakes from consistently chapped lips. Favorite lip balm by far. I've tried many other brands and always return to Burt's Bees. Works better and lasts longer for chapped lips. Just bought this product for the first time. I was hesitant as it seemed like it would be very dry, but it was somewhere between feeling glossy and dry. Would try it again. Bought this for my 4.5 year old son because I wanted a more natural balm. He likes it, says it's "spicy". 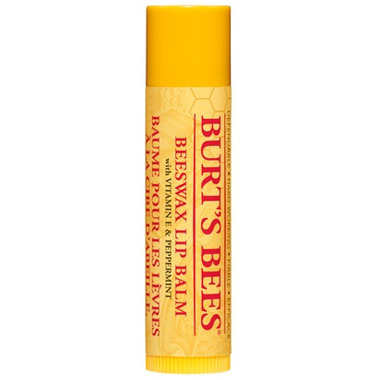 I've used Burt's Bees lip balm for many years. Have tried others from time-to-time but always return to Burt's! A class above the rest, for sure. Bought these for my kids because they have more natural ingredients. my favourite lip balm! I regret I haven't tried it years ago! Just love all Burts Bee products because it's natural, and Wells price is great! I have not had a chance to use this product yet but it comes well reviewed. My husband said it must be good as the price was high. I will let you know how I like it. Love this product! The only one I use! And so much cheaper to buy on well.ca! This is the only lip balm I will use. LOVE IT! I have been using this for years on the whole family, husband and two boys (8 & 5). The best! Best lip product ever - and natural! I alternate between this brand and Chapstick, but I prefer this one. I cannot live without this lip balm. It smells wonderful, it is not sticky, it stays in place. I will never try anything else! Generally my issue with lip balm is that when my lips are really dry and I apply a thick layer I can taste it for hours after because it's all waxy and thick. I have never once had this problem with Burt's. I have a stick in my desk, one attached to my keys, one in my coat and one next to my bed. I live in the arctic (above the 54th parallel) and I use nothing else. I'm still applying 5 times a day but with anything else it would be 15.